Hi Redtags! I hope everything is going well with you. It’s been a busy Spring here in Florida. The Columbia Accident Investigation Board is just about ready to release its report. Then we start doing corrective actions. I am looking forward to seeing the Shuttle fly again in about nine months. In the meantime, there is still plenty to do. Email from George Thompson. "Just finished the second year as Headmaster at Patterson School in North Carolina. I'm missing being in Russia but maybe next summer I'll get a trip together for a few weeks back. Anyone interested e-mail me. This year I had arranged a trip with 3 days in Moscow, 3 days in St. Petersburg and 10 days in Pskov for home-stays with Russian families while getting some lectures on Russian language, history and culture at Volny University. The tour company priced it at about $2500. Not bad for two weeks including airfare from NY. Not enough signed up. Had to cancel. I am going to see my youngest daughter for two weeks the end of June in...wait for it.....Ho Chi Minh City!! (formerly known as Saigon!) She has been there a year now teaching English as a foreign language. I'll be interested to see the airport, since I FACed out of TSN and spent the bulk of my tour in and around Saigon. I'll report at a later time with impressions. I am still upset about the ‘Bring Me Men’ business. Cheers to all! George." Thanks for the news, George. My wife and I would be very interested in that trip to Russia. At this point I am including a 40th Reunion picture of Al Jackson in his Redtag Bathrobe holding "a bottle of Alka Seltzer®." Also, I sent an email asking if the Redtags in the Atlanta area would be agreeable to a get together during the week of 14-18 July when I’ll be going there on TDY. From Mike Butler: "Good morning Jack...don't know if I'm going to be in town (currently managing disaster response in KY)...let me know if there's a gathering...would love to come." Also heard from Warren Snyder and George Harrison. I’ll let you know. Got an email from Gail Peck. "Daughter, Elizabeth, and a "friend" of mine and I went up to AFA the weekend after graduation and in addition to paying respects at the cemetery, went river rafting with Rip Blaisdell for two days. We had a ball and a great evening with Rip and Jean in their home. Hospitality plus! Rip is an AFA recreation services river guide and did a great job, even if he was the only one that didn't get pitched out of the boat in a Class IV or V rapid. (It was more than a III, wasn't it Rip? LOL). Rip's daughter, Allison, is also a certified guide and went with us on day 2. She's a great young lady. If you have even a faint interest in that recreation, get hold of Rip for details. It's inexpensive, great AFA equipment, and a real treat. Season is May through late July I'm told. After that the river is low. But, the AFA is still a beautiful place and we enjoyed the experience of being back there very much and especially the time with Rip, Jean and Allison. Gail." Thanks, Gail. Sounds like a lot of fun. Got an update from John Flanagan: "John Flanagan, accompanied by Mari Jo, was official AF representative at US Merchant Marine Academy graduation as four midshipmen were commissioned in the Air Force. He bought a new uniform since his was ‘about two generations out of style, and that doesn't include the McPeak airline captain costume.’ He wonders if he can get per diem to add to his retirement on Cape Cod. The Flanagans spent a few minutes chatting with Tom Ridge, the commencement speaker." Good update. Thanks for the words. And this from Owen Hawkins: "Great news - #3 son and daughter-in-law expecting their first baby (actually its a PAIR) .... and on Dec 25th to boot." If I remember correctly, my old roommate, Charlie Price, was born on Dec 25th. Thanks for the update, Owen. Congrats on the expectant grandchild. And thanks for sponsoring and running the Redtag Net. Got a short update from Hesh Altman: "I'm on my way to Manassas, VA, to start a new job with GMR. Bobbi is staying in Vegas to help with our grandson." Thanks for the update, Hesh. What’s GMR? Good luck in new job. provide feedback if I survive. All the best, Butch" Thanks for that news, Butch. I expect that the pilot training reunion will be a blast. Send pictures, please. In April, I attended the USAFA Class of 2006 Recognition Dining-In as the dinner speaker. They are the 12th Redtag Class and they wanted to hear some original Redtag stories. I spoke for 35 minutes about our class, recalling some stories and giving them some statistics and facts about us. The initial feedback was very favorable. Got word from Dave Bockelman about a Redtag Mini-reunion in Hermosa Beach at Roger Smith’s new restaurant/pub called The Underground. See accompanying picture. Front, L-R : Jim Whitted, Dave Bockelman, Roger Smith, Willie Holbrow. Rear, L-R : Russ Goodenough, Dan Pemberton, Bob Connolly, Mike Quinton and Jim Gallagher. Also present for the festivities were Rose Pemberton, Pat Connolly and Judy Quinton. The Southern California Group plan to repeat this every six months. 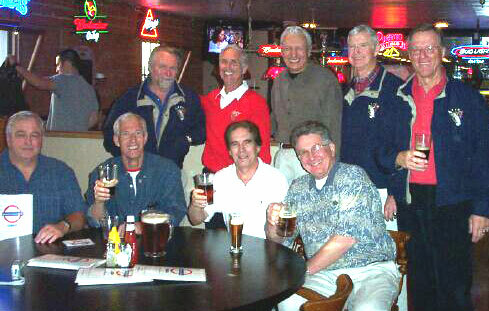 Any other Redtags in the area can contact Dave at dvdbock@aol.com for the next gathering. 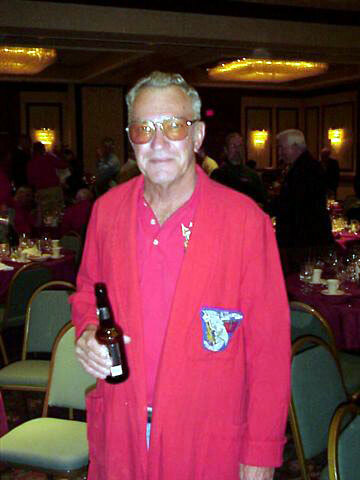 Got an email from Bob Lightsey: "I was recently racing (bicycle) in the US Senior Olympics. Got involved in a huge multiple bike crash just near the end of a 40K road race and am currently nursing a broken collarbone and broken hip. Expect to recover - but it is slow going. Too old, going too fast." Thanks Bob. Congrats to you for competing. You must be in great shape. With my shape, I’d be lucky to finish a 40 meter race, provided I didn’t crush the bike. 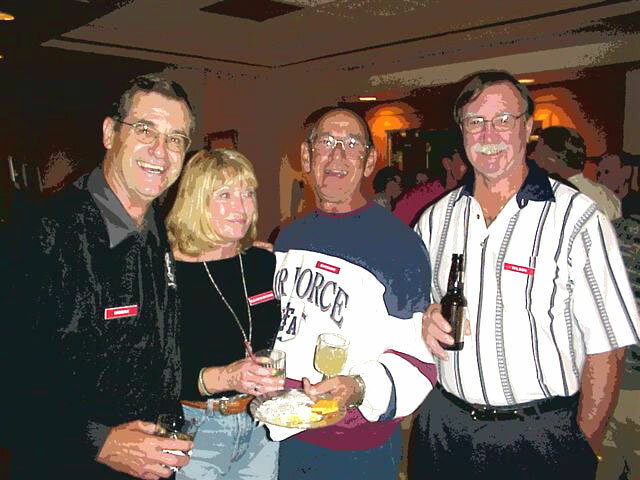 And now here is another 40th Reunion photo: Al Sigman, Shirley and Lew Svitenko and Murle Wilson enjoy the festivities. That’s it for now. Send me an update when you receive this issue of Checkpoints. If you haven’t written in 20 years, don’t you think it’s about time?